Complete Songs For Medium Voice (for medium voice). Composed by Wolfgang Amadeus Mozart (1756-1791). Edited by Ernst August Ballin. For medium voice and piano accompaniment. This edition: Paperback, Urtext edition. Paperback. Classical Period. Difficulty: medium. Collection. Vocal melody, lyrics, piano accompaniment, introductory text and english text translations. 76 pages. 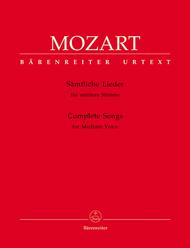 Published by Baerenreiter Verlag (BA.BA5328).ISBN 9790006502806. With vocal melody, lyrics, piano accompaniment, introductory text and english text translations. Classical Period. 9x12 inches.